Typically, when you think of smoked salmon, you think of the mass-produced, pre-packaged stuff. That may be good as an appetizer or a snack, but if you want to make a meal out of it, it's time to fire up the grill or your smoker. There are two ways to smoke salmon—cold smoking and hot smoking. Smoking a salmon is also a great way for beginners to gain some smoking experience. 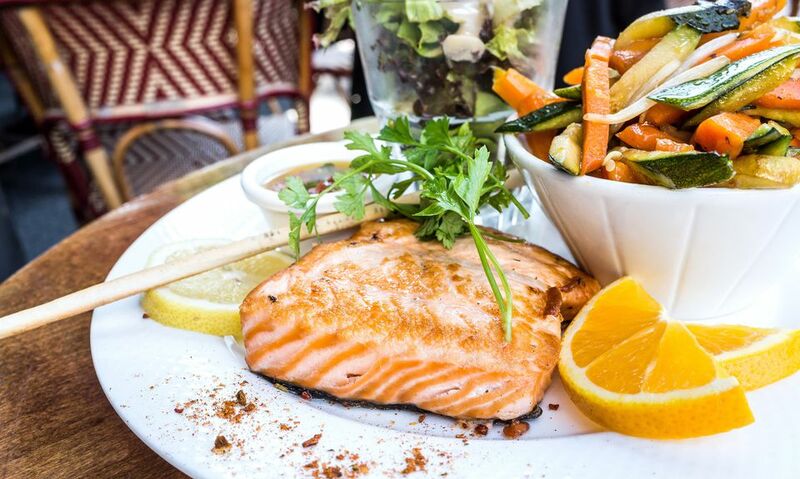 Salmon is a source of the omega-3 fatty acids, which researchers say may lower your risk of cardiovascular disease, especially when getting them from food rather than supplements. Smoking salmon is a great way to make salmon tastier than it already is. Cold smoking preserves the fish without cooking it while hot smoking makes equally great, but quite different, smoked fish. You will need a smoker for cold smoking. The temperature needs to be very low (under 90 F) and the fish has to smoke over a long period of time to get the kind of smoked salmon you are used to buying at the store. But before the smoking process even begins, the fish needs to be cured, which means coating it in salt and refrigerating it for 24 hours. After rinsing it off, place it in the cold smoker for about eight hours. Alternatively, you can hot smoke the salmon to impart the salmon with smoke flavor. The advantage of hot smoking is that you can do it in hours instead of days since no curing is necessary. If you don't have a smoker, you can turn your grill into a smoker with a few simple steps. You can hot smoke salmon steaks or fillets—the fillets will absorb a little more of the smoke flavor but can be somewhat difficult to work with. It is best to place the salmon on a piece of aluminum foil or a wood plank when you put it on the smoker. Cut the foil or plank to the size and shape of the fish so that it doesn't block the rising smoke and the smoke can move over the surface of the fish as much as possible. Smoke your salmon around 225 F (110 C) for about 90 minutes to 2 hours per pound. Watch the internal temperature. The salmon will be safe to eat when it reaches a temperature of 145 F (65 C), but it is ideal to have it reach around 175 F (80 C) so that the salmon has time to absorb as much smoke flavor as possible. As for the smoke, the traditional wood for salmon is alder. This is what the Native Americans of the Northwest used for 1,000 years or so and it imparts a great flavor to the salmon. They didn't use chunks or chips for their salmon; they used planks. By placing your salmon on a plank, you not only get to hold it together better, but the smoke generated from the burning of the plank adds great flavor to the salmon. How Do You Make Delicious Smoked Tilapia?